Heat press transfer machines provide a means of transferring your personal art work and designs to clothing & other garment items. The imprinted layout, graphic or text can be applied to a shirt, hat brim or a different fabric accessory using evenly distributed and consistent heat pressure from the heat pressing machine. The heat transfer machines we review below are ideal for home use and startup businesses. There are some other ones on the market- check out our comparison table below for some other options. 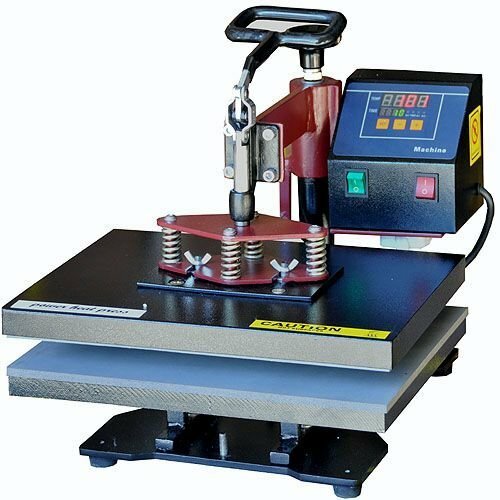 This mechanical heat press allows you to transfer printed images on a special paper and into bags, garments, t-shirts, ID badges, ceramic tiles, and other surfaces. With a measurement of 15 x 15 inches and an upward, clam-shell opening, this machine is a real space saver. Moreover, it has a silicone gel baseboard that is also pressure adjustable, allowing you to have total control over the transfer process. In terms of how long it takes to print out 50 shirts, one heat-presser writes of using this PowerPress Industrial heatpress to complete the job in an hour and a half from start to finish. Heats up quickly from 0 to 500 degrees Fahrenheit with a maximum time range of 999 seconds, allowing you to transfer faster. It comes with countdown timer and digital temperature display. Only the top plate heats up. Designed for transferring images to various surfaces including license plates, t-shirts, glass and ceramic materials, this commercial-grade mechanical press machine is ideal for those who are into the printing business. It has dimensions of 12 x 9.25 inches and with a temperature range of up to 750 degrees Fahrenheit. It comes with a digital timer and temperature control feature for easily making adjustments to the settings. Fitted with a digital timer with audible alarm system to help prevent overexposure. Its aluminum lower plate with silicon pad is elevated to easily insert and remove shirts from the machine. There are reported cases of sparks and broken bracket handles after several uses. 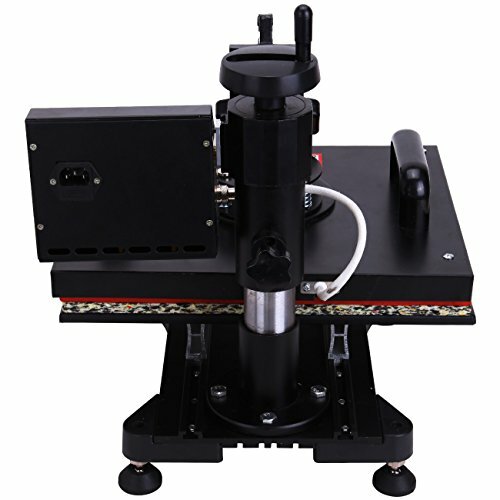 This is a relatively new 6-in-1 mechanical press machine that comes with T-shirt, hat cap, plate and mug presses. It is digitally controlled for hassle-free adjustment depending on your desired temperature and time. When you buy this item, it comes with a PTFE sheet. Heats up fairly quickly, making your work faster. There are some reports that not all 6 pieces are working properly and the bottom plate is unstable. It comes with a hinge that is fragile and finding a replacement can be difficult. It has a swing-arm design which requires bigger space in your desktop. 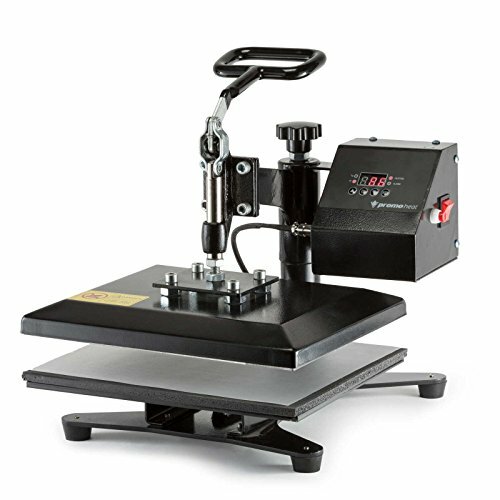 This versatile mechanical power press features five heating elements, allowing you to transfer to a variety of materials including fabric, metal, wood, ceramic and glass. It has a swing-away design for full 360-degree rotation to help reduce accidental contact when not in use. With a wide range in its pressure-adjustment knob and temperature from 0 to 250 degrees Celsius, you could easily make adjustments based on the thickness and the kind of the material used. Teflon coating (except for the cap press) prevents scorches or transfers. With an aluminum cap press, it no longer requires separate silicone sheets. Automatically stops heating when desired temperature is achieved. Can be difficult to operate for first-timers. 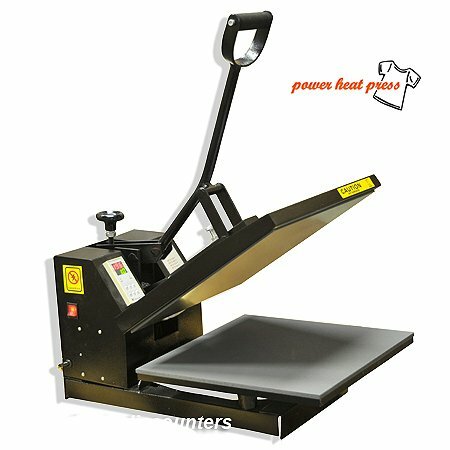 This commercial grade mechanical press machine is ideal for creating custom license plates, t-shirts and other unique items as it can be used for transferring images to different types of materials including fabric, metal, wood, glass and ceramic. It has a space-saving clam design with elevated aluminum lower platen for easily inserting the materials to be used. Its overall dimensions are 16 x 24 inches with a temperature range of up to 750 degrees Fahrenheit. Non-stick components that prevent burning of transfers. Parallel arm handle and multi-spring balancer for maintaining consistency in pressure. A number of users say that the product is quite heavy and noisy. Many people use heat press machines for their small businesses-oftentimes printing hundreds of custom-made shirts and hats every week. Heat press machines are commercially viable and can print on to a range of different items including mouse pads, canvas bags, T-shirts, sweatpants, swimming wear, leggings etc. In terms of set up, it's a good idea to place your heat press transfer machine onto a sturdy working area. Make sure that the work area allows you to access it from all three sides-this can help you coordinate your design layout most effectively. If you're looking for an alternative to big-box retailers, some buyers opted to purchase their units from Heat Press Fun. Make sure to press your material immediately prior to applying designs to it, because this will help ensure that all moisture is eliminated and remove wrinkles. These particular machines that we have reviewed are not ideal for hats, though you could use them on the flat visor section of the hat, as opposed to the rounded areas where it will be more difficult to press flat. Another solid tip from the heat pressing community is to experiment first on a throwaway T-shirt until you get the hang of how to use your heat pressing machine. Experimenting with different times and heat settings will help make you proficient in the exact calibration you will need when you begin pressing professionally. One savvy consumer has written that if you are experiencing problems with uneven heating, it is infrequently an issue with the heat press itself and more likely a problem with how the garment is laid out. It's crucial that the garment is laid out smooth and flat. Many people who have purchased heatpress machines resort to YouTube to find tutorials and explainer videos to aid them in designing and working with their transfer machines. This is a great way of learning how to use your product, especially when the instructions are not as helpful as they could be. Some users have even effectively used their heatpress machines on thin pieces of wood. In terms of how T-shirts hold up after washing, it will really depend on the type of printer that was used to generate the graphic images and the quality of the paper used to make the transfer. 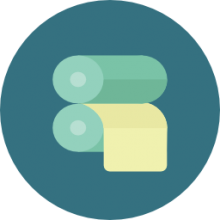 Many users have described their pleasure purchasing online because of the reduced price, quick shipping and flexible return policy. If you are considering purchasing a heat press, make sure that you read our reviews here and check out the vibrant community section of the Amazon product page. You'll find that many consumers have the same questions that you have prior to purchase. Some of the heatpress product pages contain hundreds of answered questions by dedicated users who for years have responded to specific inquiries relating to the use and operation of their heat transfer machines.